Watching this with my daughters tonight. Steve Martin's first film very funny. No tunes Mrs up early tomorrow. he was an even bigger jerk on that! It was a very young Lesley Neilsen in 'Forbidden Planet', not Steve Martin. Interesting adaptation of Shakespeare's 'The Tempest' though. By the way, if anyone here hasn't seen this film, regardless of whether you have kids or not, treat yourself. The sequel is even better, but best to start with the first one. I will be testing you on recognising minions later! Jamiel wrote: It was a very young Lesley Neilsen in 'Forbidden Planet', not Steve Martin. Interesting adaptation of Shakespeare's 'The Tempest' though. 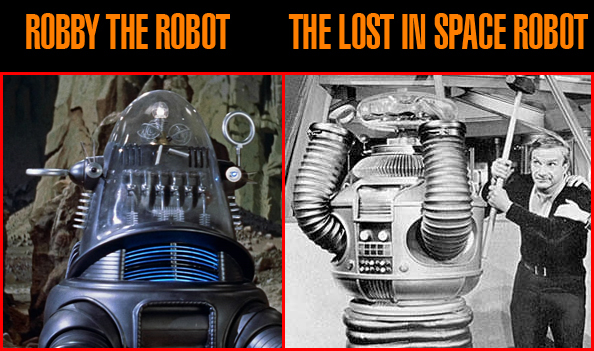 Ah, that's nuffung... i've only just learnt that Robby was not the same robot in the classic Lost in Space series! Although, Robby did make guess star appearances in two episodes. I never knew that, I alwsy thought they had bought the film Robbie cheaply for the TV series. Jamiel wrote: I never knew that, I alwsy thought they had bought the film Robbie cheaply for the TV series. Uber cool Jazz from Mr Magic and a great band. Same band and set list when I seen him live. After attending a special cyber-equality training session i can now recognise all the individual star war battle clones and well as know all their names. Last edited by red kite on Tue Dec 16, 2014 7:52 pm, edited 2 times in total. Coochy Coo Who Luvs Ya Baby?